Binsearch.info does not host any files. It is a search engine for the Usenet network just like Google is a search engine for the web. 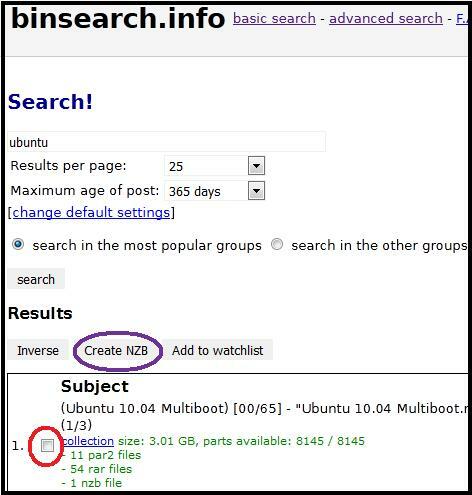 When you search for a file on Binsearch, it only provides you with links in the form of an NZB file. You must then use that NZB to download the files from a Usenet server. To download this file, you would need to click on the check-box, which is circled in red. Then, you would click “Create NZB” which is circled in purple. Then you would save the NZB file to someplace on your hard disk where you would be able to find it. Now that you have the NZB file, you can open it with Super-NZB, and it will take you the rest of the way through the process step-by-step.